Herrerin - GK - OVR 78 This spot could have gone a number of ways with several decent goalkeeper performances but nothing out of the ordinary. Herrerin gets the nod for me simply due to the three-star rating MARCA awarded him for his performance. He only made two saves but with Atletic down to 10 men alongside them only winning 1-0 when called upon he was there to save the day. Oscar Wendt - LB - OVR 76 With no Premier league, I expect Germany to be the dominant league when it comes to IFs closely followed by Spain and Italy. Although Wendt managed to score in a 2-0 win his overall performance was not that special but as mentioned with limited options I would still be surprised if this was to be ignored. Especially with Wendt picking up MOTM from Kicker. Nelson Semedo - RB - OVR 80 Usually, I would have just ignored Semedo straight off the bat seeing as though he picked up a one-star rating from MARCA but just like a few weeks ago with Raul in similar circumstances EA can't be too picky here and a Barcelona defender with a goal and a clean sheet should stand out for them regardless. Kenny Lala - RB - OVR 76 This is getting a bit ridiculous with Lala now, but if he keeps performing, why can't he keep picking up IFs? Especially seeing as though his rating started so low. If he does end up making the cut it would be his fourth IF already, making him the first do that in FIFA 19. With him scoring the only goal in the game, especially with it coming in the 93rd minute I find it realistic that he can end up making the side on Wednesday. Raphael Guerreiro - LM - OVR 78 I am sure that many will opt for Hakimi who picked up both a goal and assist from LB in Dortmund's 5-1 win over Hannover but with him recently picking up a future star item alongside the fact that he wasn't the official MOTM I am happy to snub him. instead I am going with another player with one goal and one assist in Guerreiro. The Portuguese man played in a more advanced role at LM and excelled throughout. Alejandro Gomez - CAM - OVR 84 This is another selection from which you would instantly presume another option in Dzeko but with only a 7 from Gazzetta in comparison to Gomez's 7.5 the Argentine looks like the better option. Annoyingly I have the Futmas version of Gomez but even so, this item looks very usable. Angel Di Maria - CAM - OVR 84 It's quite often the case that PSG allows an easy selection on weeks like this with big names still being needed. With the French champions running away as 4-1 winners it looks as though that will be the case once more with Di Maria picking up both a goal and an assist to be awarded a 7/10 from L'Equipe. Steven Berghuis - RW - OVR 79 With Feyenoord hammering Ajax there was always going to be at least one player feature in TOTW. There is no shortage of options either but when that is the case the MOTM is usually the safe bet. In this case it goes to a player who is often snubbed for TOTW with Berghuis. The winger picked up a huge match rating with 9/10 though with a goal and two assists to his name. Fabio Quagliarella - ST - OVR 80 At 35 years of age, it is simply remarkable what Quagliarella is able to do in Italy week in week out. He is regularly coming close to a TOTW spot but finally looks set to pick up his second this coming Wednesday after he scored twice and assisted another in Sampdoria's 4-0 home win over Udinese. Gazzetta awarded him an 8/10 for his performance which is not going to be overlooked. Karim Benzema - ST - OVR 84 One of the bigger names making the side this week comes with Real Madrid's striker, Benzema. The Frenchman scored two of their four goals as they went on to pick up all three points with a 4-2 away win over Espanyol. Yussuf Poulsen - ST - OVR 77 The easiest selection from Germany came with Poulsen, not only due to the fact he scored twice but as he also claimed player of the week with the joint highest rating of 1.5 from Kicker. His goals came in a straight forward 4-0 win for Leipzig, as they were a class above Dussledorf. Walter Benitez - GK - OVR 76 Benitez is always a popular selection with predictors with many predicting his inclusion on numerous occasions. I, however, have a 100% record with him and hope the same can be said on Wednesday with a potential SIF on the way. The Argentine made a total of seven saves to keep Nice's clean sheet in tact. Armando Izzo - CB - OVR 76 Torino recorded a 1-0 win at home to Inter with the goal being a combination of two defenders, both of whom are in consideration for this side. I am opting for the goal scorer in Izzo but at the same time, Ansaldi's assist could be enough too. Carlos Eduardo - CAM - OVR 76 Al Hilal ran away as 5-1 winners when they traveled to Al Fayah. From the match, we have two clear IF options, both of whom scored twice. Soriano is the man who misses out with only 45 minutes of football being played for the Spaniard and instead, we opt for Carlos Eduardo, scoring twice from the CAM Position. Federico Chiesa - RW - OVR 77 Chiesa broke onto the scene for Fiorentina last season and has not looked back since. Playing in the more attacking role of RW for Fiorentina this week Chiesa managed to score twice in their seven-goal thriller with Fiorentina coming out on top over Chievo, 4-3. Alfredo Donnarumma - ST - OVR 75 The only hat trick that occurred this week was over in Italy's second division during a 4-4 draw. That obviously makes the prediction significantly harder and I doubt we will see scores anything like last weeks 19. Donnarumma should be nailed on for his SIF though, especially with him being gold. Tammy Abraham - ST - OVR 74 With the Premier league not playing due to FA Cup fixtures, it was always a chance for a few championship golds to get the nod, with less being needed to be noticed. Abraham has been consistently performing for Villa in recent weeks and another two were added to his seasonal tally on Saturday with him scoring both Villa goals in a 2-1 home win over Ipswich. Rogelio Funes Mori - ST - OVR 77 It was as recent as TOTW 17 when Funes Mori picked up his first IF which is only a three-week gap. In the past, this distance between IFs has been very hit and miss. If there were enough options I would have probably ignored him but his two goals put him among the best performances of the week, especially with it coming against Club America. Monterrey ended up winning the match 3-2 from which no less than 4 red cards were shown. 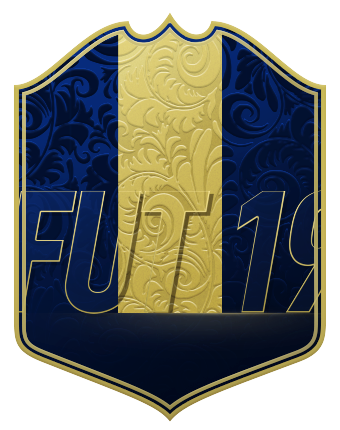 Jason Denayer - CB - OVR 74 I don't believe that Denayer's scream item will change his rating but I am playing this tactically just in case it does. With the reserves being the hardest position to fill it does cover the potential of it happening. The Belgian scored the only goal of the game as Lyon went on to record a 1-0 win. Mateusz Klich - CM - OVR 72 Leeds found themselves one down to Rotherham on Saturday which when you are challenging for the title is not a result you will be happy with. Klich then scored twice, of which one came in the final minutes of the match to help turn the game around, allowing Leeds to pick up all three points. With limited competition and Leeds remaining in first place this ones likely. Juan Muniz - LM - OVR 67 The top division in Spain didn't offer many IF options and thus the second division could easily make one of those space up with Muniz being involved in all three of Lugo's goals in their 3-2 win. All three came in the form of assists but usually, that is enough for EA when selecting these sides. 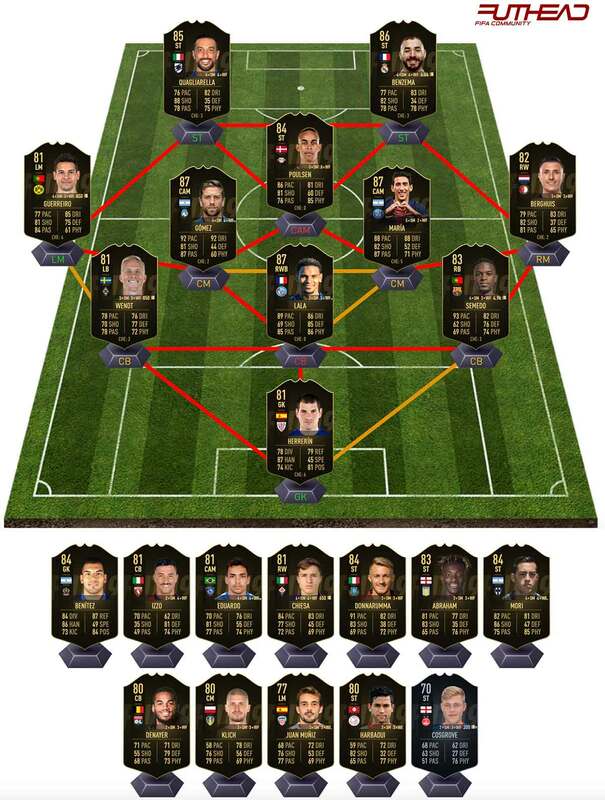 Hamdi Harbaoui - ST - OVR 74 Belgium's domestic division offered very little in terms of TOTW options but I can't see the league missing out entirely again. With no hat tricks, it leaves the door open for strikers that you wouldn't usually see and with Harbaoui claiming the joint highest rating for his brace he could sneak in. Sam Cosgrove - ST - OVR 60 I had not actually noticed it before last week but the past 7 sides have all had one silver in, even if EA tried to force it with cook last week before eventually changing it. That being said it looks as though they aim to include one silver and thus Cosgrove seems an obvious selection. The Aberdeen striker scored twice and assisted another in their win.